This past weekend was momentous. First, I had the weekend off for the first time in...many, many months. Actually, probably since I went to residency in January, which doesn't count because that's school (fun school, but still--I'm lucky if I get six hours of sleep while I'm in Vermont) and before Vermont I hadn't gotten a weekend off since before Christmas, so the point is, I HAD THE WEEKEND OFF. And it was glorious. I also turned in my third packet of school work. Which was glorious, but also mildly terrifying. But the best part about this weekend? 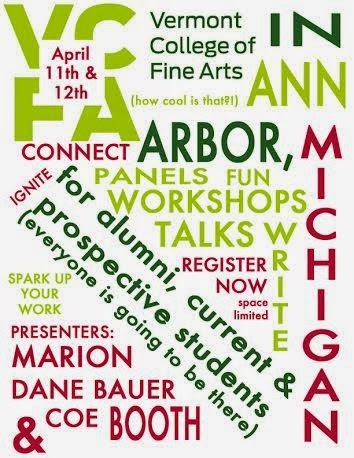 I went to Ann Arbor for VCFA Day, orchestrated by the fantastic Debbie Gonzalez and sponsored by my beloved VCFA. I'm down for any sort of VCFA get-together, even if it is in a 7/11 in the middle of the desert, but Ann Arbor was truly a lovely place for this shindig. It is the land of indie bookstores, great food, and fantastic people (re: Debbie Gonzalez!). The best part about VCFA Day is that it is for everyone! Truly. Alumni, current students (shout-out to LoriGoe Perez Nowack who was my fellow current student, soon-to-be-alumna there), prospective students, writers who just love kid lit and want to learn more about the craft. It was an event for all and I loved meeting everyone. We had about 25 people show up, and the majority of the people there weren't VCFA, so we had the great pleasure of witnessing to them the Gospel of Vermont. But we also just got to hang out and talk about writing and learn from Coe Booth and Marion Dane Bauer and wow, what an experience. The next day was an all-day writer's extravaganza. Coe's and Marion's lectures and workshops were fantastic, as expected. They picked great topics that really appealed to the wide range of writers in attendance--from picture books to YA--and were insanely useful and helpful. I think I speak for everyone when I say that we all left energized and excited about getting back to work and with some new insights about how approach whatever we're writing. Me, I realized that I had to flesh out another character before I could write the scene I really, really, really want to write because I think it'll be fun and cool and smart. But. Not yet. And it's okay. This is writing. And in true VCFA fashion, we finished the evening off with another get-together where we had our own cave in the basement of this cool restaurant, which sounds super shady, but it was actually quite awesome and there was a guy who kept bringing us platters of tacos and goat cheese, so basically it was a cave of food happiness. And bookish talk and fun. With some amazing writers. Thanks so much to Debbie Gonzalez for organizing the event and for Vermont College of Fine Arts and Kelley Bordeleau-Lamb for bringing a bit of Vermont to Ann Arbor!